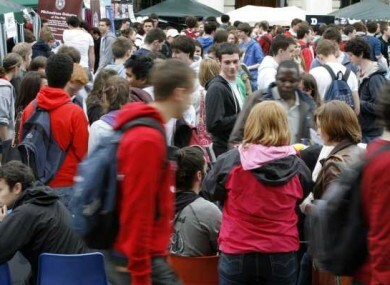 Michael D Higgins tops a nationwide opinion poll of almost 2,000 students across Ireland’s seven university campuses. LABOUR’S PRESIDENTIAL CANDIDATE Michael D Higgins has topped a new nationwide opinion poll of students’ voting intentions. Higgins can count on the support of 34 per cent of students intending to vote in the October 27 ballot, according to the poll which was carried out across all seven university campuses in the State last week. David Norris, whose national showing has diminished in recent weeks, remains a high performer among student voters – counting on 25 per cent of votes. Independent Sean Gallagher scored 17 per cent of support, while Martin McGuinness took 12 per cent of the vote. Mary Davis, Gay Mitchell and Dana Rosemary Scallon all performed poorly, with 6, 4 and 2 per cent of the vote respectively. 74 per cent of the students polled – numbering almost 2,000 – said they were planning to vote, but almost a third of those students said they had not yet decided on their first preference. Higgins topped the poll in five of the seven universities, being outperformed only in NUI Maynooth and in the University of Limerick, where Sean Gallagher is the most popular candidate. Higgins’ support is so in Trinity College – at 44 per cent – that he easily outperforms David Norris, who has represented the college in the Seanad since 1987. His share is still a healthy 30 per cent, however. Martin McGuinness’s share of the vote is staggered nationwide, with 17 per cent of students in UCD and the University of Limerick offering him their support, while only 3 per cent of voters in Trinity College would do likewise. This mirrored a similar poll carried out in advance of the general election, when Sinn Féin scored 6 per cent nationally but did not have the support of any of the Trinity College respondents. Dana Rosemary Scallon is easily the least popular candidate among student voters, with no prospective voters in Limerick, while only 2 of the 603 students polled in UCD were planning to vote for her. 1,962 students from all seven universities in the state were surveyed for the poll, which was carried out last Thursday. The poll’s findings have been weighted to account for the varying student populations of each college. The poll was organised by UCD’s College Tribune, in partnership with TCD’s University Times, DCUFM and The College View in DCU, ULFM and An Focal in the University of Limerick, Sin newspaper in NUI Galway, The Print newspaper in NUI Maynooth, and studentnews.ie in UCC. Email “Higgins tops nationwide poll of students' Aras intentions”. Feedback on “Higgins tops nationwide poll of students' Aras intentions”.